Hines will build the six-story T3 Goose Island building with heavy timber. Design by DLR Group and Michael Green Architects. 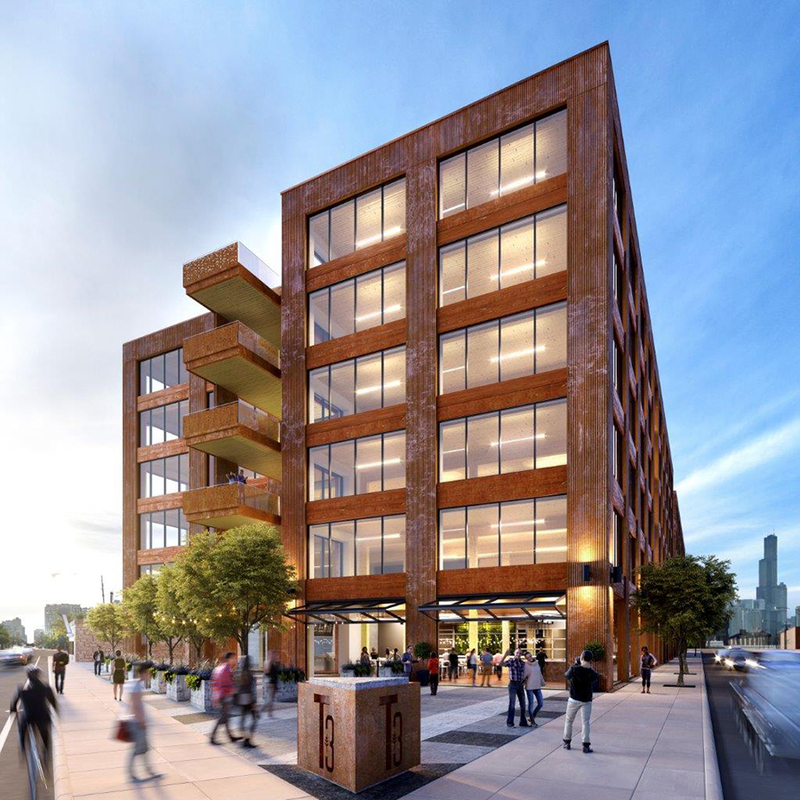 CHICAGO – (Realty News Report) – Instead of framing its next Chicago office building with the typical steel, Hines will build the structure with wood – the first wood-structured office building developed in Chicago since the 1800s. The six-story, heavy-timber building will be called T3 Goose Island. “The environmental benefit of using wood on T3 is the equivalent to taking 966 cars off the road for a year. With timber as the structural system of the project, T3 will be one of the most environmentally friendly and sustainable developments in Chicago,” Hines said in a news release. Hines, the Houston-based real estate firm, it will develop the 270,000-SF T3 Goose Island in a joint venture with Diversified Real Estate Capital and Big Bay Realty. Goose Island, an industrial and manufacturing hub since the 1850s, is now being reinvented as a highly desirable office location surrounded by the most affluent residential neighborhoods in Chicago. The City Council has approved a development plan for the area that includes public, pedestrian and bike-friendly transit options, and open space to take advantage of Goose Island’s natural setting on the Chicago River. Until 2015, the T3 Goose Island site was home to Big Bay Lumber. Designed for collaboration and work/life balance, T3 will offer an exceptional complement of amenities including common social areas, a shared rooftop deck, private tenant-only balconies on each floor, bike storage and repair, a modern fitness facility with locker rooms, and ground floor retail. Founded by Gerald D. Hines, the Hines company is a privately owned global real estate investment firm founded in 1957 with a presence in 201 cities in 21 countries.